VIA Technologies has just unveiled a new COM (Computer-on-module) that is based on new Mobile-ITX form factor. 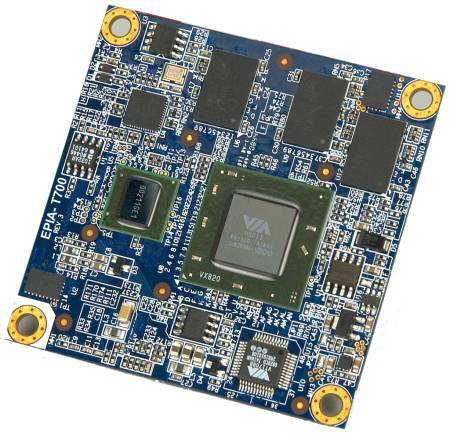 Claimed to be the smallest COM form factor in the industry, the platform with codenamed of Via Epia-T700 is mainly targeted for embedded applications such as healthcare, in-vehicle infotainment and even military usages. Measured at only 6cm x 6cm, the COM will be powered by Via C7-M ULV processor clocking at 1.6GHz. Further coupled with VX820 northbridge/southbridge combo, it can be provide hardware acceleration for multiple media formats such as MPEG-2, MPEG-4, VC1 and WMV9. Supported with 512MB DDR2 memory down (on board), the device is almost like a tiny PC and with its industry standard interfaces such as USB 2.0 ports, PCI Express, IDE port, SMBus, GPIO, SDIO and etc, it can be best fitted to almost any embedded segments without much limitation. And all these are well packed into a tiny form factor with reasonable power consumption of less than 12 watt. As a comparison, it is even smaller than Qseven (around 4900 square mm) that only takes up 3900 square mm. No pricing and availability yet, the X86 based platform can be loaded with Linux, Window CE, Windows XP and XP embedded suitable for different market segments.